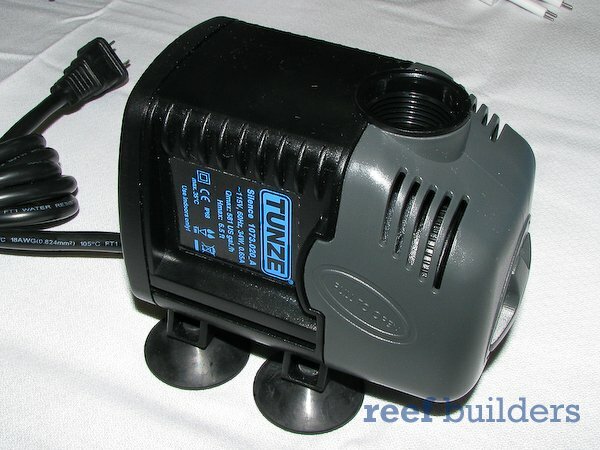 This review of Tunze’s 1073.020 silence pump is well over eight months in the making. In that time we have used and abused the ole Silence ’20 in every position imaginable: We used in the basement, we used it on a double decker set up, we’ve pushed some medium and large recirculating skimmers but most of all, we have settled on using the quiet one (not that Quiet One) for an aquarium on our desk. So far this pump has been tested on quite a wide range of applications but it always started and restarted without fail, and it has done so without any maintenance or servicing of the impeller assembly. Any pump that can go through our water pump bootcamp and still be worthy of use in the Reef Builders office will be part of the water pumping arsenal FOR LIFE. Don’t let that low pressure water flow curve fool you, the ~$90 Tunze Silence 1073.020 may be rated for 634gph but even with lack of pressure the Silence ’20 still managed to deliver 350-550 gph under most applications. The pump is available from Aquarium Specialty, Premium Aquatics and The Depot, check out our previous posts for more deets on the line. Can anyone chime in on their experiences with the Tunze Hydrofoamer Silence pumps? Looking for a German distributor of Tunze Silence Water Pump – 1073.020. Also a complete technical data sheet and operation instrictions would be of great help.